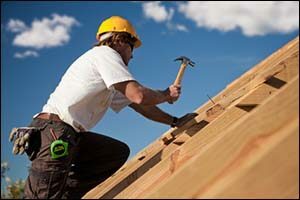 Energy Efficient Roofing: Quality Roofing Materials in Easton | Boss Services Inc. It seems as though everyone these days is look for new ways to make energy efficient improvements to their home. One way to reduce energy consumption is to take a look at your whole home, starting at the top and working your way down. Quality roofing materials and smart installations from your trusted Easton roofing contractor, can really make a big difference in the efficiency of your home. In fact, even small adjustments can make a visible improvement in your annual energy bill. A revolutionary idea in roofing starts with the idea of a “cool” roof. This concept proposes that a roof that is light in color will be cooler than a roof that is made from dark shingles. It has been proven that by using lighter colored quality roofing materials, energy can be saved by reflecting the heat and light of the sun away from the structure, instead of absorbing it. Studies have shown that these minor energy efficient improvements can make significant savings in energy consumption for cooling in the summer. In the summertime on a hot day, dark-colored roofing can be as high as 150 degrees or more, depending on the median temperature outside. Cool roofing that is made from lightly colored shingles and materials, can be 50-60 degrees cooler than a traditional roof during the same hot summer day. In urban areas, this helps to reduce the potential for a “heat island” effect, as is seen in large cities in the summer months. In suburban areas, it helps homeowners to reduce energy consumption, lessen the strain on busy HVAC systems, and provide better thermal control. Speak with your Easton roofing contractor about options for creating a cool roof. The next way to make energy improvements that will reduce energy consumption for your home is to try insulation. When the average person thinks about energy efficiency, particularly with regard to heating and cooling, they think about insulation. Most homes that are just ten years old or more, do not have the proper amount of insulation in their attic or the rest of their home. When you work with your Easton roofing contractor to do roof repairs or putting on a new roof with quality roofing materials, don’t overlook the insulation. Your contractor can help you to choose the best options for your home that will keep cold air out in the winter and keep hot air out during the summer. Proper insulation for your roof is one of the best energy efficient improvements that you can make. A well-designed roof that includes proper roofing insulation can cut your heating and cooling needs considerably. The type of quality roofing materials that you will use depends upon the type of house that you have and the location that it is in. Homes out on the Cape will have different needs from homes that are inland, just as homes that are in California will have much different needs from homes that are in New England. Work with your Easton roofing contractor at Boss Services, Inc. for the best solutions in energy efficient improvements. You will hear this word a lot as you shop for quality roofing materials and materials for the rest of your remodel or renovation. Sustainable materials just means products that were made from materials that don’t make a big impact on the environment. It’s not about the high-tech innovative materials that you read about in the home improvement magazines, more often than not, sustainable roofing is about using traditional materials that were created with the environment in mind. For example, sustainable fiberglass rolls are made from one of the most sustainable materials on the planet – sand. If sustainability is important to you as you work with your Easton roofing contractor to reduce energy consumption, make sure to talk with your technician about your concerns. Sustainable, quality roofing materials are designed with your particular climate and type of structure in-mind, ensuring that your home is effectively heated and cooled, depending on your needs and the season, without wasting energy. It is important to choose a roof that will last for many years, but will also reduce energy consumption. Your contractor can help you find solutions that will provide you with the best of both ideals. For over two decades, our team of highly trained and experienced roofing experts have installed quality roofing materials for clients all over Massachusetts. We will install a water-tight roof using a specialized five-step weather stopping system that will protect your home for many years. A manufacturer’s lifetime warranty plus the knowledge of our craftsmen means that you will get the best possible results from this Easton roofing contractor. Call today at (508) 297-0635 to get a QUOTE on any of our professional services.